If there was some kind of chart for overachieving in the field of cake, right now I woulds be significantly off that chart. The needle on its spectrum gauge would be teetering nervously out of control. (Can’t help but follow this up with “in my mind“, the hilarious-in-our-minds insult that Tim and I hiss at each other all the time after the other person says something implausible. Or even just something like, you know, “I have lots of friends!” “In your mind” – see? Effective.) Anyway, why all this self-directed hyperbole? I made up a Christmas Cake recipe. And it turned out pretty delicious, damnit. And then – I went and iced it myself too. 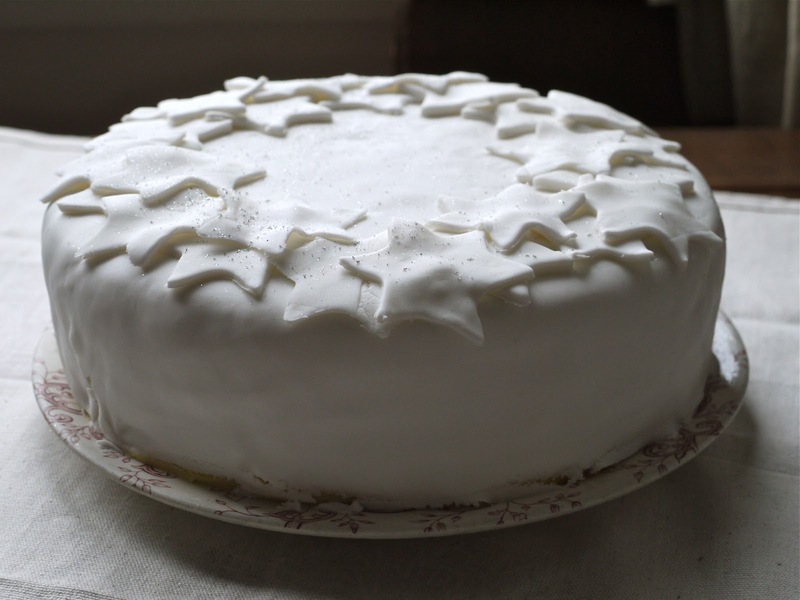 Aye, it’s only November, but not only is Christmas Cake the sort of thing you can make way ahead of time, like the overexcited person you may well be, it’s also good to be prepared. As that angry lion in the Lion King sang. And anyway, is the kind of cake you can make while it feels like you’re disorganisedly letting everything slide – it’s that easy. Even the icing is manageable. I know it’s divisive – I’m not personally the biggest fan of it, especially because marzipan costs about $12 for a small cube and so you have to use almond flavoured icing, for which not one single almond suffered in the making of. 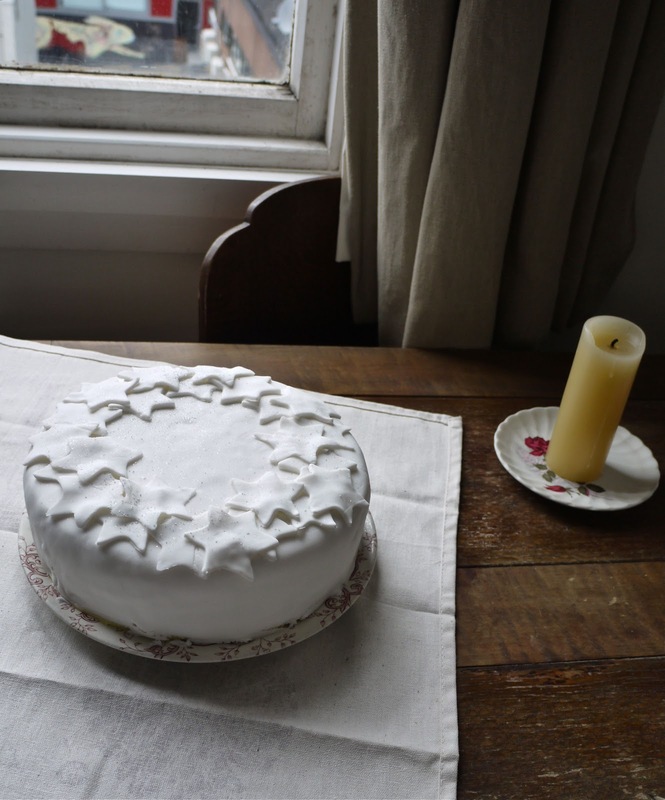 But it’s a fun challenge and you get to have this dazzlingly gorgeous cake to admire, eat, or pick up and reflect the sun off, to annoy the neighbours. Pro: Voting for people in competitions a now-normal part of life. Pro: I really am one of the best online writer in NZ about food. Pro: You only have to vote once during the whole thing, not daily! Hey-ohh. Con: Voting’s done through Facebook, so if you don’t have one…you get to dodge this whole hornet’s nest. So this con is really a sneaky pro for some of you. And I realise there are far more crucial voting situations going on right now. Am not going to talk about my opinion in that area, although it shouldn’t be hard to guess. But if you are in New Zealand please exercise your right to vote this Saturday – it’s one of the more important things you can do and I think back to all those who fought so that women could do this today. Your voice counts and you have the responsibility – think about everyone who you could affect with this and choose wisely. Back to the Christmas Cake. Fa la la la la. I’m looking forward to December this year actually – Tim and I have been stocking up on old-timey Christmas records (so cheap! I love that I always want the vinyl no-one else wants) and I’ve got plans underway for the best, more hard-out flat Christmas Dinner ever. I don’t want for much this Christmas, and our very short trip up home last weekend where I got to hang out with Nana and see so many people made me feel highly anticipational for some whanau time over lots of food. 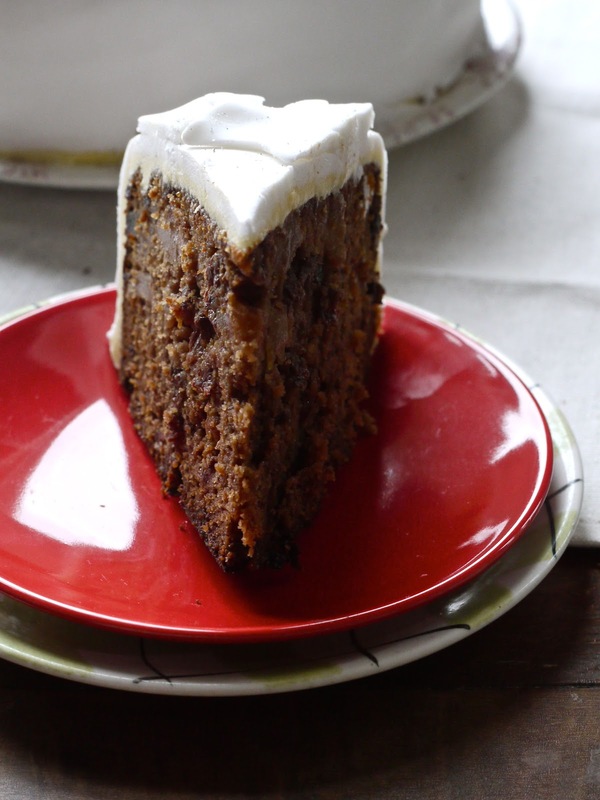 I’d been reading through a lot of old, old cookbooks and Nigella’s books and all sorts of cookbooks, and my braincells were tickled by all the variations on Christmas Cake. 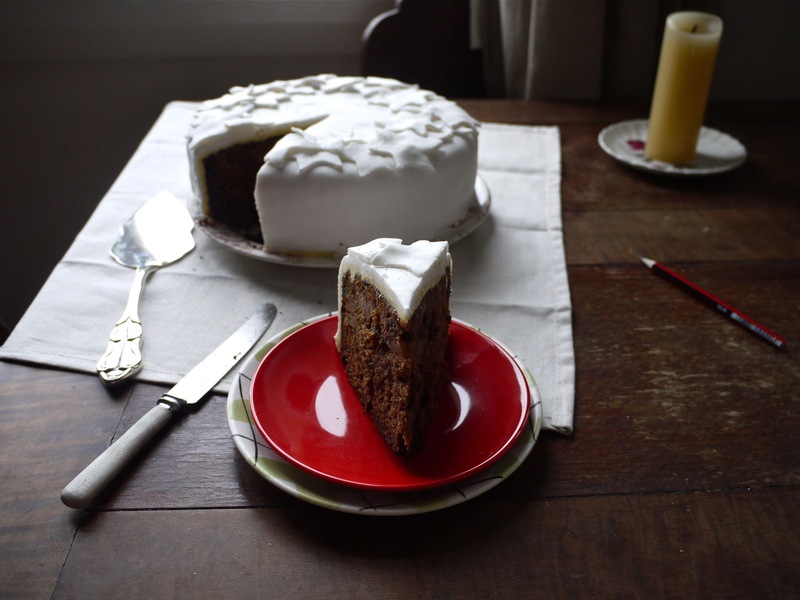 I was really keen to try adding my own to the squillions of recipes already out there – a kind of mash-up of all the things that sounded fun about other Christmas Cake recipes. So I included a whole can of condensed milk, because having that on the ingredients list pleases me. I soaked the fruit in ginger beer and rum – Gunpowder’s – spicy and intense – because how cool does that sound? (Are you starting to see a pattern emerging here? I’d see an ingredient, think “funnn” and that would be that.) I used dried pears which sounds extravagant, but it’s more stupidity on my part, I bought them once on the supposed insistence of Nigella Lawson, ended up too fearfully nervous of how much they cost to make anything with them, and now they’re nothing like the plump, full-of-potential specimens they started as. However, after a bathe in some rummy ginger fizz, they’re perfect for a fruit cake. You could use apricots, dried apples, or anything within that realm of wrinkly fruit, really. The real question is: did it taste okay after all that? 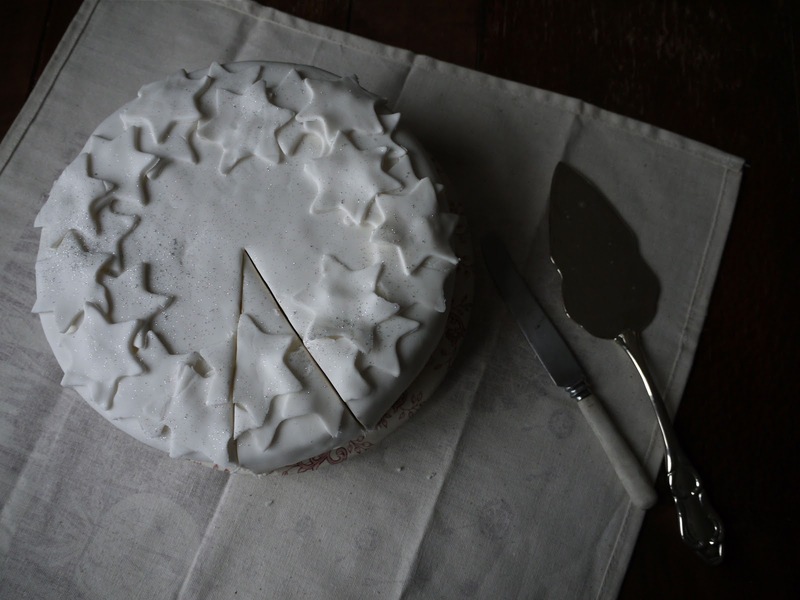 Can you really just go making up a Christmas Cake? Bit of a concern, considering how much fruit and nice liquor and time and effort and so on went into it. Luckily – BRILLIANT. Like, deck the halls with boughs of deliciousness. And even if it turned out tasting like rum-soaked sawdust, it is pretty. It’s a tall, but surprisingly light cake, as far as this kind of thing goes, with a distinct caramel-toffee vibe from the condensed milk. Strangely the ginger wasn’t as prominent as I thought it’d be, but the dark rum definitely makes itself felt. The dried pears give a fudgy, grainy sweetness, and the sultanas are, well, they fulfill their role of being a sultana (is anyone passionate about the sultana?) All the little things – the cocoa, the cinnamon, the orange oil – mesh together to form this mysteriously tis-the-seasonal flavour. All up: It worked! Dunno how the pencil got in there. It’s…artistic? 300g dried pears or dried apricots or dried apples etc – or a mix. Soak your fruit overnight (at least) in the liquids. I’d say there was 1/2 a cup of liquid left when I made my cake so if you’re nervous, drain out that much and discard/drink the rest. Take a 22-23cm caketin, line the base with a double layer of paper and then, as best you can, line the sides with a double baking paper which extends about ten cm above the edge. Pulling out a long piece of the paper, folding it in half, making it into a loop and then shoving it into the caketin and hoping for the best tends to work for me. Melt the butter, sugar, condensed milk and spices together gently. Remove from the heat, stir in the fruit and its liquid and the baking soda. It might fizz up a bit at this point. Beat in the eggs then carefully sift and stir in the flour, making sure there’s no lumps. Tip into your prepared tin, and bake at 140 C for around 2 1/2 hours. Pierce it at various intervals with either a cake tester or a piece of dried spaghetti and tip over a capful or three of rum. Title via: Queen of my ear canals, Mariah Carey, with the immortal All I Want For Christmas Is You. Will we ever see another modern Christmas song that’s as good as this? Doubties. Reach Out (I’ll Be There) – Four Tops I probably mention this song once a month, but I think for a song like this it’s okay. Frankly. And I love the “RAH!” at the start of each verse. Idina Menzel, Heart On My Sleeve. If you can’t bring yourself to vote for me, at least indulge me by watching this entire video from start to finish – it’s slow but so beautiful and never fails to make my tear ducts spring into action. Next time: Probably hounding you respectfully for votes again, but also aiming for some cool recipes you’ll want to try immediately. Thanks for the reminder that it's Christmas cake time. Nigella inspired me to bake my first one last year. 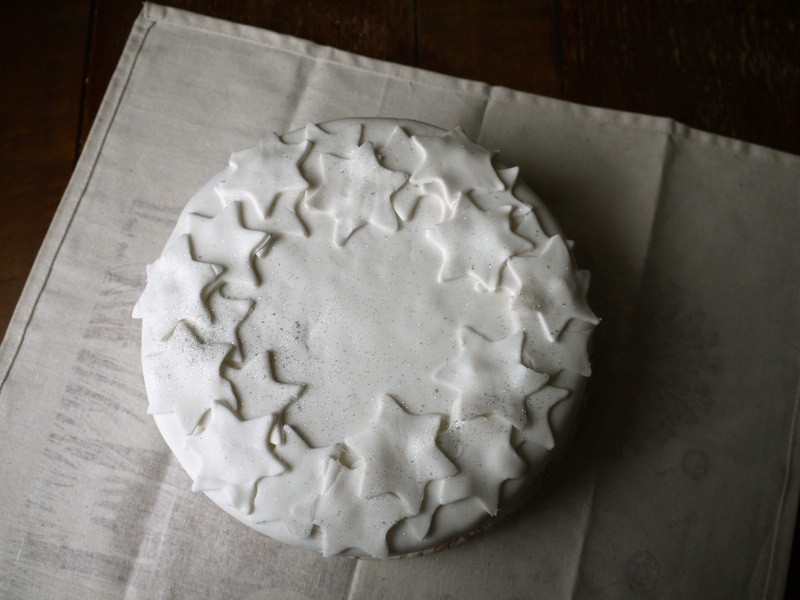 Her Easy Action Christmas Cake, from Feast, was super easy… so easy in fact, that I was convinced there would be something terribly wrong with it. So I cut it open and ate a piece… and before the end of the weekend there was none left, and I had to make another one. Dried pears and dried cherries from Moore Wilson's. Worth every cent! that is a serious wedge of christmas cake! 🙂 will be in india for christmas this year but I'll save this for next year – i like the ginger-beer/rum idea. my grandma who used to be a dietician in a busy hospital kitchen taught me the art of icing a christmas cake although she now also paints marzipan roses etc wheres I'm just happy with smooth corners. a generation thing maybe. question: how far in advance did you make this? 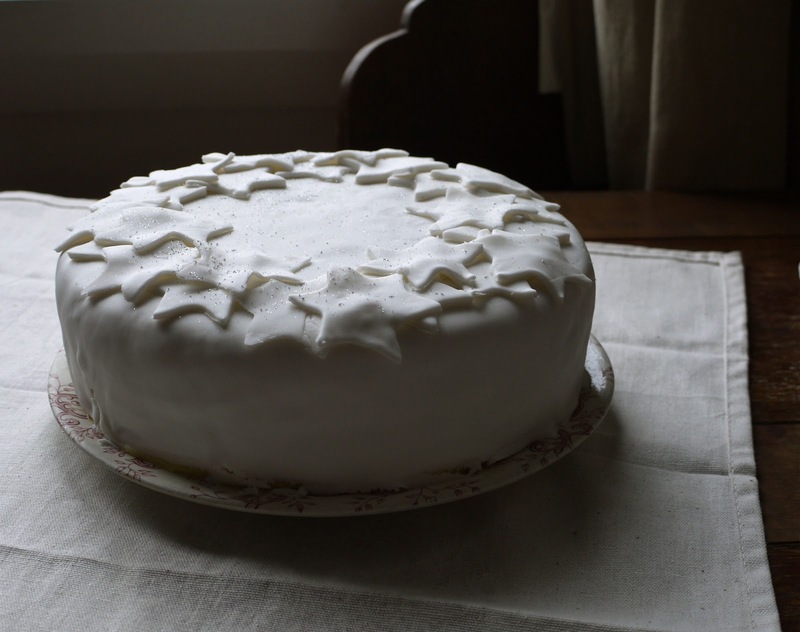 we have a family story of a forgotten christmas cake (made in september) that was enjoyed in april – and I've heard that they only get better with time if you pack em up good. although condensed milk .. maybe that would'nt be so good sitting around? Fab job on the icing 🙂 it looks great! Nom! That is so my idea of a good hearty Christmas Cake! Hi, I'm Manu from VP Forum!!! I love this cake. Last Christmas I made one decorated like this!! Woo! Cake looks gorgeous, I particularly like the ginger beer and rum soaked fruit, and adding condensed milk (how do you think of these things?!). and congrats on the nomination; I've 'liked' you! I wouldn't exactly say that orange oil is optional. I'd say ti's the devil and should be cast into Mordor, because then we might have here a Christmas Cake that I might actually accept a slice of. In my mind. P.S. Voted for you already! Wow, Laura, that looks fantastic!! That settles it. You are making our Christmas cake this year. Voted! And the cake looks just beautiful! Laura, it looks fabulous! Well done you on making it all up in your mind! I'm going to binge on your tutorials right now. I'l be in Welly 10-12th December, can we catch up? Oh and I totally voted. Loving the ginger beer idea. Awesome. This was only made last week, but I'd love to try making one earlier in the year, and start soaking the fruits even earlier than that…might have to put that on the list for next year! Alas, I don't have a facebook, so I'll only be able to vote for you…. in my mind. But in my mind I can vote as many times per day as I'd like. This cake is phenomenal, and a nice video to go with it. I love fruitcakes, but it's not as much the tradition here to make your own. You love me. You really love me.